Aalayam - Colors, Cuisines and Cultures Inspired! : Weaves of India - Exploring the Sari landscape of India! 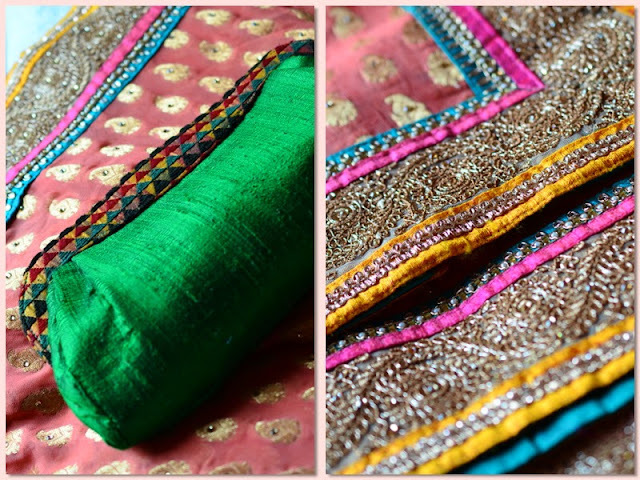 Weaves of India - Exploring the Sari landscape of India! Today, we are going to explore the textile heritage of India through a showcase of gorgeous weaves from across the country. Most online articles trace the origins of our textile traditions back to the Indus Valley civilization. Textiles were extensively traded much like our spices back then and today our rich textiles are immensely favored by world- designers! I am a fashion purist! A big believer of time-tested classic styles, if you will. Transient trends such as the net saris and sequined petticoats do not cut it for me. And therefore, I am on a personal fashion mission to collect saris from all over India simply for the love of varied textures, fine weaves, striking hues and intricate motifs. I have only begun and it has already been a fascinating exercise! I believe the sari is the greatest ode to our fabulous textile heritage and perhaps the longest fashion trend known to man! It is a forceful ideogram of my cultural identity and a resilient symbol of our sundry textile industry. So, dear Aalayam readers, sit back and take delight as I whisk you away on an aesthetic journey to discover the fabric landscape of India. The lesser known Ilkal sari which originated in the Bagalkot region of North Karnataka features the unique Tope Teni weaving and the Kasuti (hand) embroidery (via wiki). The distinctive red/maroon border on these saris adds a tribal flair and makes the ilkal refreshing in its modesty and rustic appeal. The Ikal sari holds a dear place in my heart as this was the first sari that my husband bought for me many moons ago and exemplifies the loving bond we share. 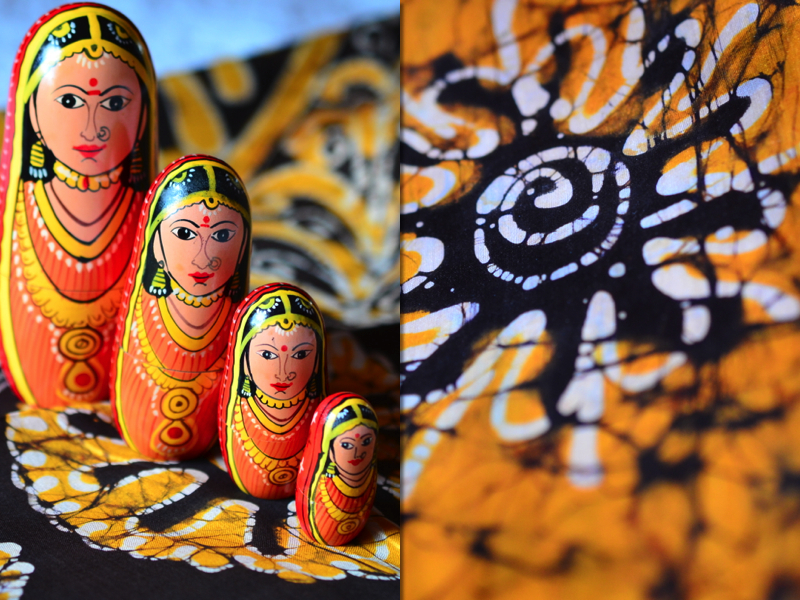 Over the years, I have added two more exquisite Ilkals to my stock, handpicked by my mother-in-law. And for this cherished association, the Ilkal is highlighted first on this list! What can I say! Some of you probably remember that I did an entire post on the kanjeevaram sari and here is an excerpt "The kanjeevaram sari is a piece of art and I have remained a diehard Kanjeevaram loyalist till date. Every South Indian girl holds the Kanchi pattu close to her heart. After all, it is a part of her bridal trousseau! And for me, the kanjeevaram sari has been de rigueur at every other celebration as well! My fondness for the sari is well known!" I don't know of any other sari that can match the enduring elegance of the Kerala Kasavu. No, really! The tranquil ivory tone complimented by the luxe gold border of the kasavu sari has been a cultural trademark of the gorgeous women of Kerala from times immemorial and holds its appeal even today. If you are a sari aficionado, then your bank would be incomplete without the Kasavu. The art of draping a sari is as interesting as the diverse textile heritage itself. If there is one sari that allows for a perfect drape then it is the Mysore Silk. I love the way it makes me feel! Emanating from the land of the Maharajahs, the Mysore silk is indeed aristocratic in its appearance. Known for its texture and luster, the resplendent Mysore silk is a seemly tribute to legendary Mysore. As you get ready to display your Jambu Savari for this year's Golu, why not celebrate in a traditional Mysore silk sari ? Displayed in the picture is another personal favorite - a gift that is a token of my pregnancy and a reminder of many treasured emotions! Patola is a splendid example of hand-woven artistry. The weaver implements a double ikkat weave to turn the Patola sari into an impressive piece of art replete with geometric designs and intense hues. Did you happen to catch the stills from Lakme fashion week this year.Designer Gaurang Shah's repertoire was jaw droppingly gorgeous. He worked with Patan patola as his medium and chose to don his show stopper kirron kher (yes, the ultimate sari diva herself) in a stunning Navrathan Patola. I love the handwoven texture on mine- I think it makes the sari exotic! Another sari, another dyeing technique! The Javanese wax-resistant dyeing technique or the Batik dye adds splashes of color and a boho-chic vibe to the Indian six yards. This bold Batik in complimentary colors is from my 8o year old grandmother's closet which is now a precious addition to my sari collection. Fashion trends are cyclical and so the Batik is back! I can always upcycle my grandmother's conventional sari with an edgy accessory for an updated look! So, what is the connection between a global design trend and a tiny village in Andhra Pradesh, India? A dyeing and weaving style known as Ikat. 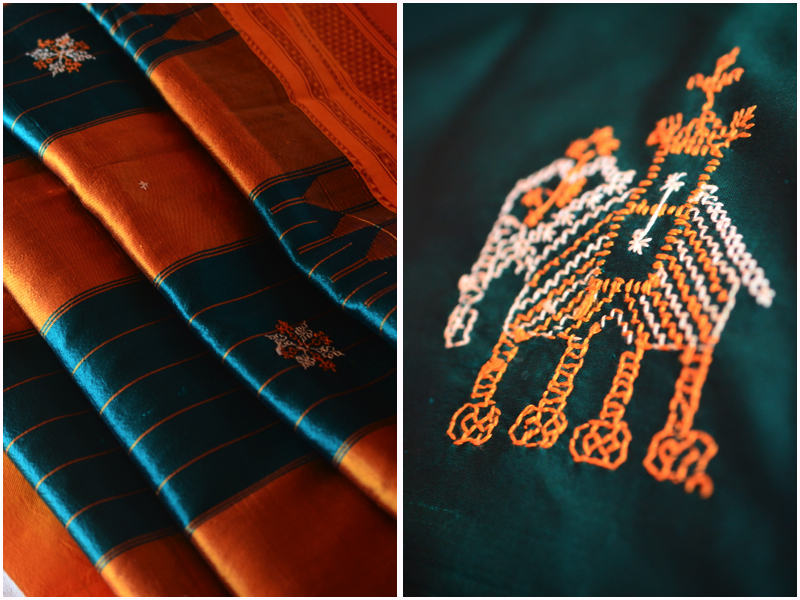 The pochampally sari is fashioned in the Ikat style and could very well be the Patola's twin. However, regional influences separate the two. This too belongs to my grandmother. This was my way of bringing a part of her here to my home. I regret that I never brought her here to visit us. She is frail now and cannot make a trans-atlantic trip. The saris will always serve as a reminder of my grandmom's simple yet impeccable sense of style that I am grateful to have inherited. Her tenacious spirit belies her frail health much like the Pochampally itself whose vibrant colors and striking patterns mask the signs of wear. If you are looking for an avant garde fashion statement then the zardosi embroidery is it! Sported by most Indian runway models and bollywood heroines, elaborate zardosi embroidery gives the sari an opulent up-do! Zardosi=haute couture! Zardosi work involves embroidering with metallic threads to add a generous dose of sparkle and we love that in our wedding and festive finery, don't we? Out next stop on the textile tour is Bengal. 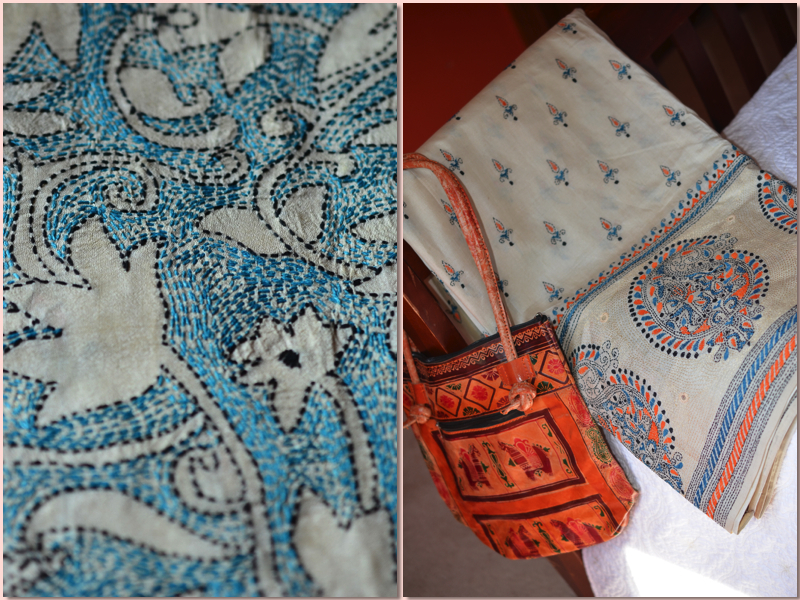 The intricate Kantha embroidery, a hot favorite world over, is from Bengal. Fashion for me is about being true to who you are. I believe in details and nothing beats the sophisticated detailing of the kantha embroidery. A silk Kantha is subtle and classy and adds a refined elegance no matter what the occasion. I can see myself wearing a Kantha sari to a western gala, a soiree, a banquet or a cocktail hour! A weaver somewhere in Bihar/ West Bengal weaves his magic into a Tussar silk and breathes life into it. The tussar silk is magical! Light weight and linen like, the sari is an easy drape! I love the versatile utility of these saris. This hot pink Tussar silk paired with a geometric border and a contrast pallu was my absolute favorite. Subsequently, a serendipitous shopping find in the form of this elaborate silver necklace became the perfect accessory that this Tussar silk demands! With this gorgeous outfit, I am ready to paint the town pink, don't you think? We featured a little spotlight piece on the art of block printing in a previous post and here is an excerpt "There is nothing more simple and sophisticated than block print fabrics. An ancient textile imprinting technique, block printing is done by artisans in rural India and these handmade fabrics are perfect inspite of their imperfections!" The delicate beauty of the symmetric block prints makes the sari a visually appealing piece of art. My persimmon and black sari was a thoughtful gift from my dear aunt who knew of my sari -mission. The block prints on this beautiful cotton sari paired with a causal embroidered fabric bag creates an eye-catching ethnic extravaganza! And I am going to wrap up this edition of weaves of India with what I fondly refer to as the princess of silks (remember, the kanjeevaram has already won the title of the Queen!) The stunning brocade from Varanasi, the Benares sari, is an exquisite production. A collector's item, if you will. So much goes into weaving the delicate gold and silk threads together to create this silken tapestry of unmatched beauty. On a religious tour last year, my mom picked up this beautiful plum Benares with white silk threadwork for me. Maybe, someday, I could even convert this into some kind of a wall art? It was a great pleasure to do this feature on a topic so close to my heart -India's unparalleled textile heritage! I would be remiss if I did not thank my mom, grandmom, mother-in-law and aunts for enabling my indulgence! Sanganeri, bomkai, tanchoi, chanderi, paithini, venkatgiri….so much more to talk about! All images are the copyrighted property of Aalayam. Credits: My husband! "I envy your beautiful collection. It is refreshing to see your elegant saris that do not overwhelm. Perfectly chosen pieces to exemplify each weave/ craftsmanship. I can appreciate them more now that I've learnt the back story. The tips on accessories are definitely helpful. I would have loved some draping suggestions too. In the day and age when computer designed saris abound you have invested time and money in authentic handcrafted works of art. Way to go Deepa!" and ofcourse, my friends don't let me off easy :) she added that "it ran a little too long and discuss abt each shot - some other time "
dear Lakshmi: this post was done with an audience like you in mind. A connoiseur of fine things that you are, i knew you would totally dig this! Thank you for reading! draping suggestions - again, classic styles are my fall back! thanks also for keeping me grounded! i had already emailed supriya that this post was way too long. however, my passion got the better of me - i wanted the reader to be able to compare and contrast and did not have the heart to chop it into a 2 part post - and i had (!) to include anecdotal accounts in the narration- so, pardon the length. discuss each shot? you mean the ideas behind the composition ? :) i pinged lakshmi because i was running out of ideas and she ofcourse indulged me! thanks again! An absolutely wonderful collection of textiles !!! After reading this post, there's a new found love for the saris that I've been hoarding for so long. and that's how I was, took all my gorgeous sarees for granted and then in an aha moment realized that I had some precious things in my closet and i just didnt know how to appreciate them :)and soon that developed into a love for for fine craftmanship. Beautiful post, pictures !! Love your blog. Thanks for visiting mine and leaving a comment otherwise I would not have found this lovely Indian treasure box!! Purnima: Thanks for stopping by, I think we are right next to each other in the indiblogger rank order (for whatever that's worth!) and that's how I stumbled on to your lovely blog! I am glad you like what you see. Come back, a home tour is up next. Beautiful collection and photos. The block print looks like kalamkari. Uppada, Mangalagiri pattu also adds great addition to your collection. div: this is also why growing older is fun - things that you once took for granted, you now have an appreciation for! This post makes me very happy, you know. Why don't you do some more, maybe focusing entirely on muslins and cottons in one, on silks in another? And crepes, nets, laces and georgettes should also get their due. Maybe the different kinds of sari embroidery? I can keep on asking, so I will stop right here! A weave that's got a bad reputation right now, being Mamata Banerjee's saree of choice, is the Dhanekhali. I've loved them since my teens because they are supremely comfortable and look very relaxed, unlike the stiff tangails and the delicate dhakais. They usually come in stripes, with the occasional temple border, no zari, and don't need falls or edges stitched. In fact, many women wear them at home. Oh sue! I first have to revisit darling ole Calcutta and take you on a shopping expedition. I knew about jamdani - are the dhanekali, tangails and dhakais - variants of the jamdani weaves ? will add to my list! see, this is why i love the blog - learn something new, everyday! more power to our tribe! -sari lovers, i mean! it's a fascinating hobby! thanks for reading sangitha - i am sure being a sari lover - you can appreciate what goes into each of these weaves. I am sure you have Sahana - that's just it, these aren't fancy designer runway sarees , they are easily available and yet there is so much to them! I had a blast looking through my grandmother's closet. To discover a treasure trove right at home was so much fun! Awesome! What a nice collection of design sarees. Those Sarees took my breath away!!!! Thanks for sharing your photos. Generally I do not understand material on weblogs, but I would like to say that this write-up very forced me to examine out and do it! ohh, nice representation Indian Sarees with there culture aspect. This is a lovely post. Exquisite saris and beautiful words!! can i use one of your images ? disha - which image in particular and where do you want to use it? We would like you to credit Aalayam and link back to this post if you are using it on the www. Nice Collection. Saree Is a Indian Traditional Wear. Women's Look Stunning When Wear Traditional Indian Sarees. Nowadays it's easy to find Indian Ethnic Wear Online at best offer price. Thanks for sharing!! nice collection of traditional saree. Nice Photos. I like the way you have portrayed the silk sarees collection. Batik printed sarees showcase enchanting patterns in the form of contrasts formed between dyed and undyed areas by covering the parts of the saree with wax and then dyeing the saree which upon drying is removed. At Shatika, we have an exclusive range of Batik print Sarees Online. Really very informative article about sarees designs. Thanks for sharing! !